Generation Y, or young adults generally 18-32 years old who grew up in the Information Age, have been dubbed the ‘Net Generation.’ But, while these “digital natives” may be savvier with their gadgets and more keen on new uses of technology, their elders in Generation X, the Baby Boomers and older generations tend to dominate internet use in other areas. 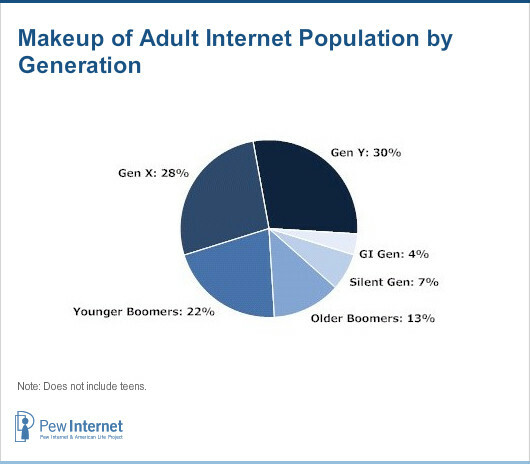 The web continues to be populated largely by younger generations, as over half of the adult internet population is between 18 and 44 years old. But larger percentages of older generations are online now than in the past, and they are doing more activities online, according to the Pew Research Center’s Internet & American Life Project surveys taken from 2006-2008. The biggest increase in internet use since 2005 can be seen in the 70-75 year-old age group. 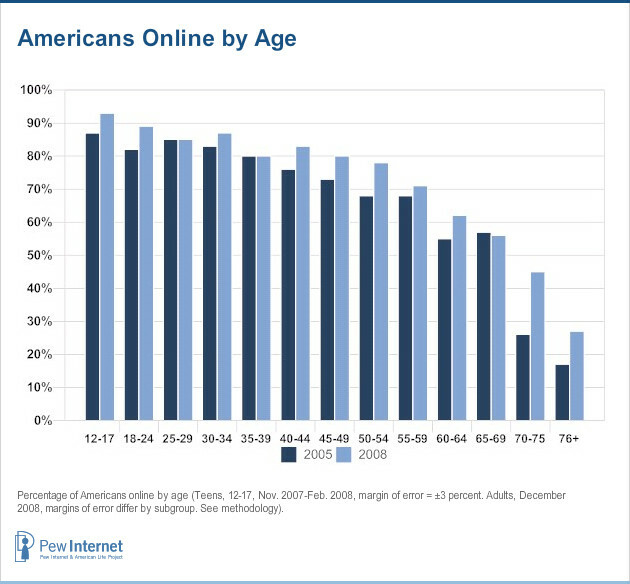 While just over one-fourth (26%) of 70-75 year olds were online in 2005, 45% of that age group is currently online. Much as we watch demographic and age groups move up in “degrees of access” on our “thermometers,”5 we can probably expect to see these bars become more level as time goes on. For now, though, young people dominate the online population. Instant messaging, social networking, and blogging have gained ground as communications tools, but email remains the most popular online activity, particularly among older internet users. Fully 74% of internet users age 64 and older send and receive email, making email the most popular online activity for this age group. At the same time, email has lost some ground among teens; whereas 89% of teens claimed to use email in 2004, just 73% currently say they use email. 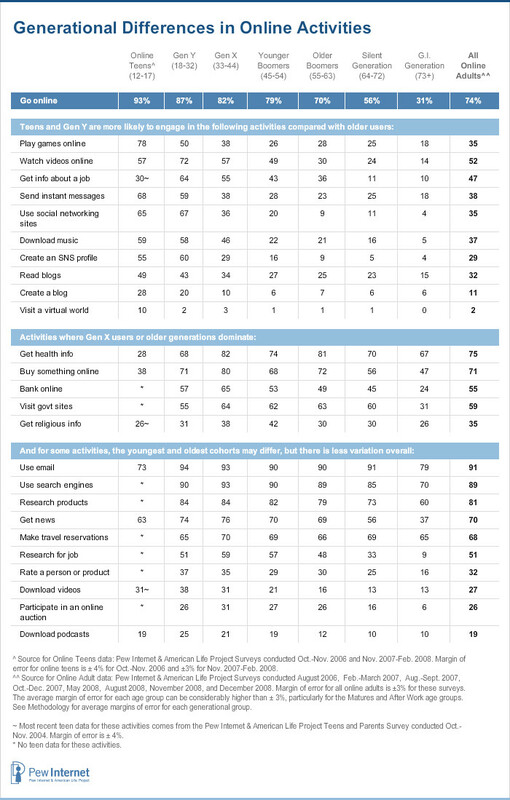 Teens and Generation Y (internet users age 18-32) are the most likely groups to use the internet for entertainment and for communicating with friends and family. These younger generations are significantly more likely than their older counterparts to seek entertainment through online videos, online games, and virtual worlds, and they are also more likely to download music to listen to later. Internet users ages 12-32 are more likely than older users to read other people’s blogs and to write their own; they are also considerably more likely than older generations to use social networking sites and to create profiles on those sites.6 Younger internet users often use personal blogs to update friends on their lives, and they use social networking sites to keep track of and communicate with friends.7 Teen and Generation Y users are also significantly more likely than older generations to send instant messages to friends. By a large margin, teen internet users’ favorite online activity is game playing; 78% of 12-17 year-old internet users play games online,8 compared with 73% of online teens who email, the second most popular activity for this age group. Online teens are also significantly more likely to play games than any other generation, including Generation Y, only half (50%) of whom play online games. Compared with teens and Generation Y, older generations use the internet less for socializing and entertainment and more as a tool for information searches, emailing, and buying products. In particular, older internet users are significantly more likely than younger generations to look online for health information. Health questions drive internet users age 73 and older to the internet just as frequently as they drive Generation Y users, outpacing teens by a significant margin. Researching health information is the third most popular online activity with the most senior age group, after email and online search. Internet users ages 33-72 are also significantly more likely than younger users to look online for religious information and they are more likely to visit government websites in search of information. Generation X (internet users ages 33-44) continues to lead in online shopping. 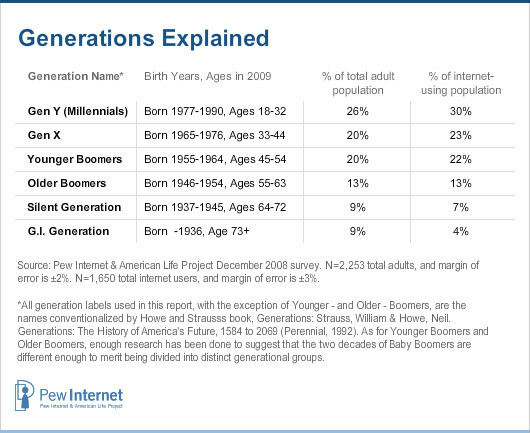 Fully 80% of Generation X internet users buy products online, compared with 71% of internet users ages 18-32. Interest in online shopping is significantly lower among the youngest and oldest groups; 38% of online teens buy products online, as do 56% of internet users ages 64-72 and 47% of internet users age 73 and older. Generation X internet users have also maintained their edge in online banking, as they are significantly more likely than any other generation to do their banking online (67%). As Generation Y users get older, however, they have grown much more likely to bank online as well: the percentage of online Generation Y to do their banking online is up from 38% in 2005 to 57% in 2008. At the same time, those generations older than Generation X have remained relatively equally likely as they were three years ago to use the internet to do their banking. A few online activities that were previously dominated by either older generations or younger generations are now being done more equally across all generations under 73 years old. One such activity is downloading videos, an activity that in 2005 was significantly more popular with teens and Generation Y than with any other generation. Generation X is catching up, as 31% of that generation claim to download videos as of 2007, compared with 38% of Generation Y. Generations on the oldest end of the spectrum also became significantly more likely than they had been two years before to download videos. Some 13% of G.I. Generation internet users (age 73+) reported downloading videos, up from 1% in 2005, and another 13% of the online Silent Generation (ages 64-72) say they download videos, up from 8% in 2005. Perhaps less surprisingly, Generation Y is also gaining significant ground in some activities previously dominated by Generation X and older. In addition to becoming more likely to do banking online, Generation Y has also grown more likely to make their travel reservations online. In 2005, half (50%) of Generation Y internet users had booked travel arrangements online, and, in 2008, that number rose to 65%. During the same time, the percentages of Generation X and older generations to make online travel reservations remained about the same. The workplace online network is expanding to include more Generation Y users.9 Internet users 18-32 are going online more than ever to do research for their jobs. In 2007, 51% said they used the internet for their jobs other than for email, compared with 44% of the same group in 2005.